I will be asking you to make cards that feature specific rhetorical device, that I will define and provide examples of. 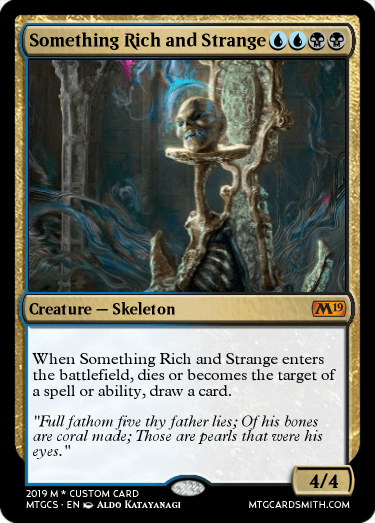 Many people use these without knowing it, so this should be much less work than the couple dozen people that made cards based on historical figures. At least one of the following rhetorical devices should be used in your entries. Allusion - Allusion is a reference to a well known piece of writing, art, etc. This can be done visually or textually. 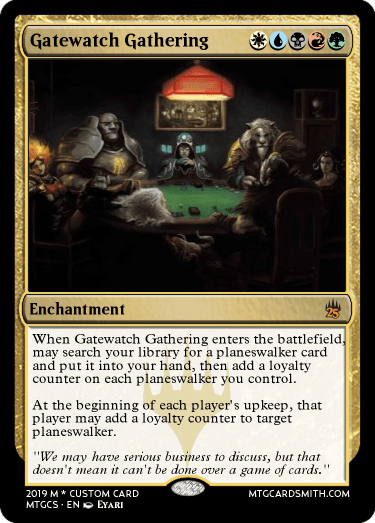 The Gatewatch Gathering references the famous painting Dogs Playing Poker. Blind Seer references a well known poem by Dorothy Parker. Oxymoron - A contradiction between two words that are paired together. The phrase loving hate contradicts itself, being that hate and love are opposites. Other examples include are Great Depression, Pretty Ugly, Virtual Reality, Honest Liar, etc. Paradox - Paradox is a device that contains words or a phrase that contradict one another in a way that should render it impossible. 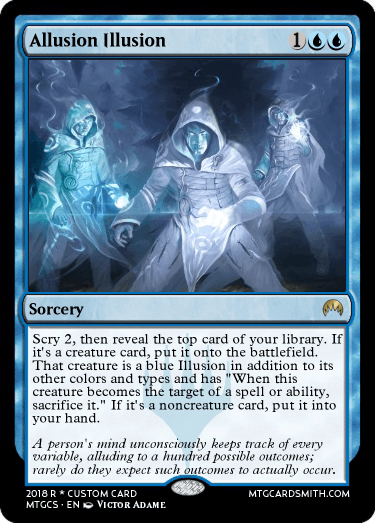 The concept of a blind seer is paradoxical, being that blind people can't see. 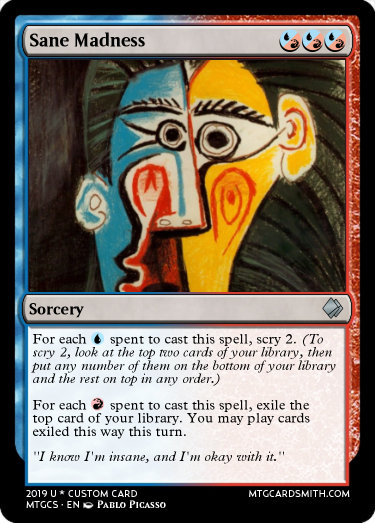 Illusion sounds like allusion and many people do actually mistake them, and thus using them together like this is an example of Paranomasia, but not necessarily the best one. Situational Irony - A contrast between what is expected and what occurs. A textual example would be someone staying up all night to study for an exam, but then falling asleep in that very exam. 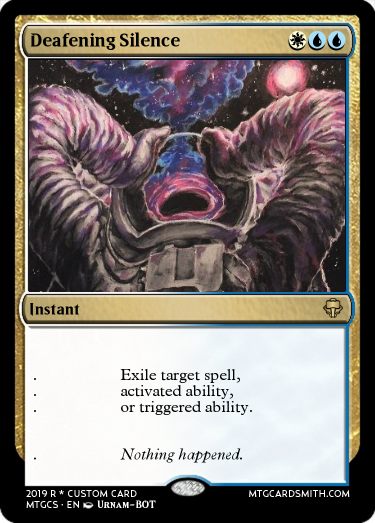 The flavor text is ironic, being that even if you were to make this comparison with the concept, you would expect rules to be the point of reference for irrelevance. If anybody could provide a better example, that would be well appreciated. In each of the categories, the following prizes will be distributed. 1st: 5 favorites and a follow. The overall highest scoring entry will also win 1 month of premium membership. 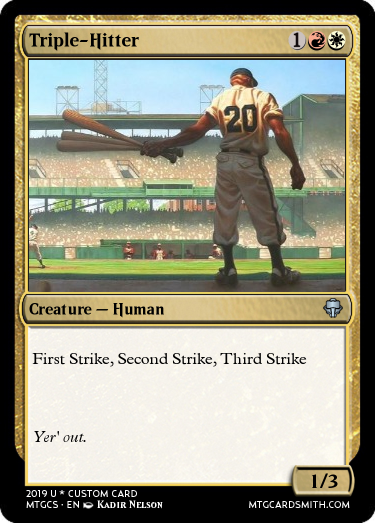 CARDS MUST BE MADE IN 2019. NOTHING FROM PREVIOUS YEARS!!! Closed for entries on 2/20/19. Eh... no. I did not include Rhetorical Questions in the list. Ok, I thought it was one of the ones you listed. I'm still interested, though. It was one on the last iteration. 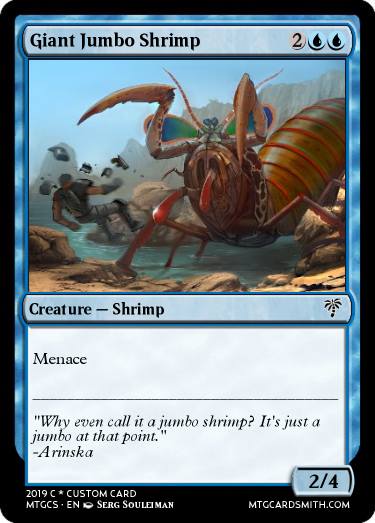 Are we able to make puns in the flavor text? Yes. 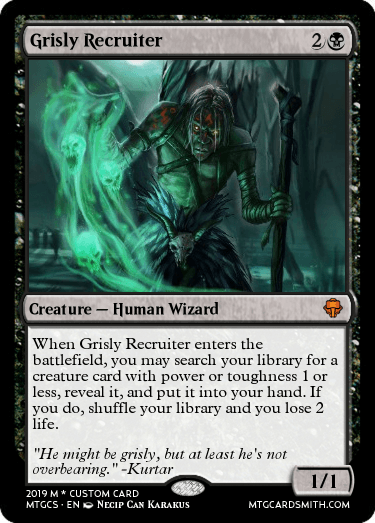 I’d be impressed if the pun was in the rules text without breaking syntax, but it wouldn’t be necessary. @notmyprimespeaker, the effect is a bit redundant, but I do get a kick out of it! Sane madness probably would’ve worked better, but yes. @Djs10301, what device are you intending? You are also allowed more than one entry. I finally got around to making it. 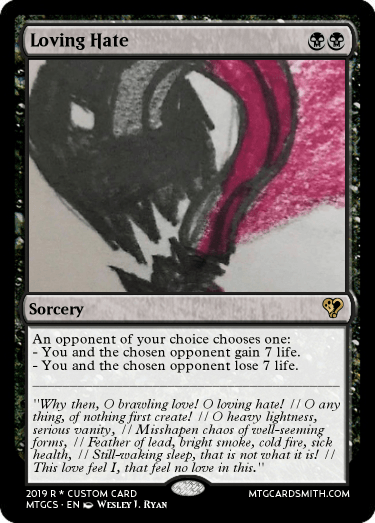 An allusion to my personal favourite poem both in the name and flavour text. 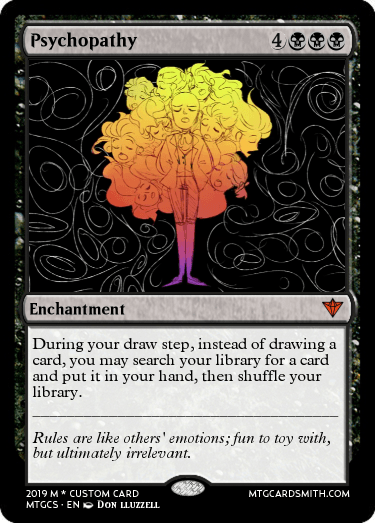 Got one for Oxymoron; tried to add some visual flourish with center-justified text– I couldn't hide the periods needed to space the text, so I might end up going back and re-doing this card with characters to add visual detail in the text box. 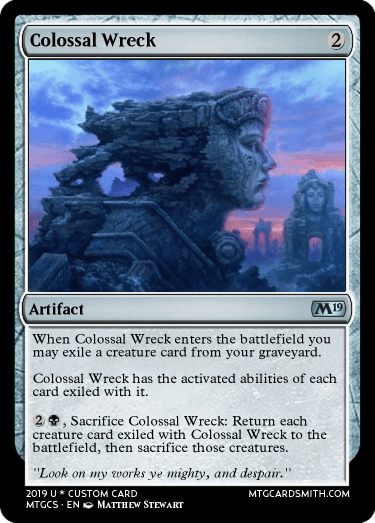 I also have an alternate design which is a bit more mechanically flavorful, but less functional. So, I've got a two-fer in Paranomasia. I don't know if I'm allowed more than one entry in the same category, but I thought of this one and I just had to make it! Based on an excerpt from a really memorable speech from The Tempest. Yes, you may make multiple in the same category, but you should try branching out. A mutation is a genetic development- something new, whereas atavisim is a biological throwback- something old. As such, mutant atavism is an oxymoron. Seems more paradoxical that oxymoronic, but being that paradox is also a category, it's still a valid entry.